CORVALLIS, Ore. – Oregon State University has received $88 million from the National Science Foundation to lead construction of a second Regional Class Research Vessel to help bolster the nation’s aging academic research fleet. The National Science Foundation selected Oregon State in 2013 to lead the initial design phase for as many as three new vessels, and the National Science Board authorized as much as $365 million for the project. Last summer, the NSF awarded OSU a grant of $121.88 million to launch the construction of the first vessel, which Gulf Island Shipyards, LLC in Louisiana is building and OSU will operate. It was the largest grant in the university’s history. 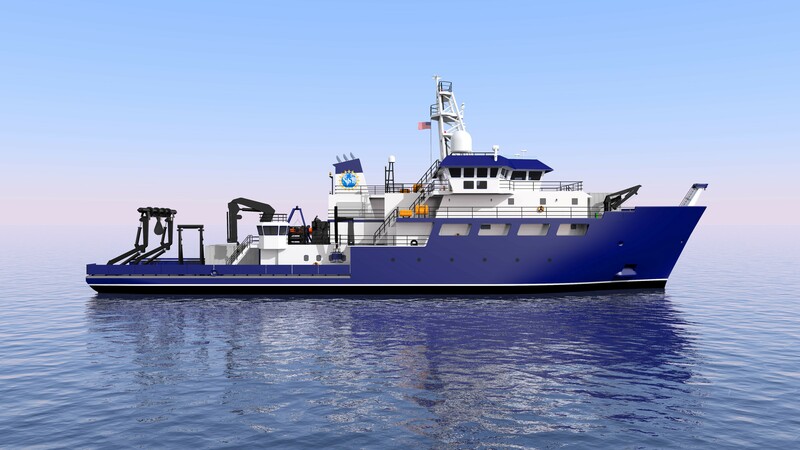 The company is about to begin physical construction of the OSU-bound vessel, which is scheduled to be delivered to Oregon State in spring of 2021, and fully operational after a year of outfitting and testing. After receipt of the additional $88 million, the university exercised an option within its contract with Gulf Island to construct and outfit a second ship. NSF is in the process of identifying and selecting an institution to operate this second vessel – likely situated on the Atlantic Ocean or the Gulf of Mexico, according to Demian Bailey, project co-leader for OSU. “The second ship is expected to be delivered to its operating institution sometime after the fall of 2021,” Bailey said. The new ships are essential to support near-shore research as the United States and other countries face unprecedented challenges to their coastal waters, said Roberta Marinelli, dean of Oregon State’s College of Earth, Ocean, and Atmospheric Sciences. The ships will be equipped to conduct important seafloor mapping, which has become of significant importance following devastating tsunamis triggered by subduction zone earthquakes in Indonesia and Japan. The Pacific Northwest is considered a high-risk region because of the Cascadia Subduction Zone, which has produced numerous major earthquakes of magnitude 8.0 or greater over the past 10,000 years. The ship’s ability to stay out at sea for 21 days before returning to port for fuel and supplies. “This class of ships will enable researchers to work much more safely and efficiently at sea because of better handling and stability, and a suite of advanced sensors for measurements to characterize the atmosphere, ocean water and seafloor,” said Clare Reimers, a professor in the College of Earth, Ocean, and Atmospheric Sciences and project co-leader. Bailey said a full year of testing is necessary before the new ships will be ready for scientific expeditions. More information on the ships and the project is available at: http://ceoas.oregonstate.edu/ships/rcrv/.